To create this nail art, I used my sister's kiddie nail art polishes, which, to my surprise, are a lot more professional than I expected. These polishes include a brush and a micro-pen (a needle-like pen with a hole) that releases a tiny amount of polish to create intricate designs. The polish also has a gel-like consistency and dries much faster than regular nail enamel. Lastly, because they are formulated specifically for children, these polishes are non-toxic and totally safe to use. QUALITY: Although I like the innovation and technology of these polish pens, I'm not quite sold on the actual product. Out of the 8 colors in the set, only 5 are nicely pigmented and completely opaque. These colors are: Black, White, Orange, Blue, and Pink. On the other hand, the purple is a throw away, the green is only visible when used over white (see "The Tree of Life" nail art) and the yellow needs several coats to be opaque -- which is OK, if used as a base. Note: designs using yellow as decoration are more textured than others. Because I'm right-handed, my natural instinct is to overcompensate for my left hand by controlling it and creating extra detailed designs. It takes me longer to do my right hand with my left, but I end up with crispier lines and a more intricate outcome. The drawings on my left hand, however, feel freer because the lines aren't as precise. I'm not quite ambidextrous just yet, but I'm working on it! 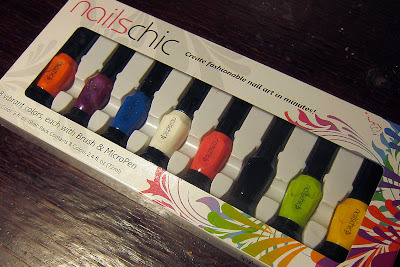 This nail design collection isn't for the faint at heart and took about an hour to complete, not counting drying time. The "EYE C U" thumb nail art took the longest: at least 10 minutes, while the "Abstract Tiger" and "Graffiti Scribbles" pinky nail designs took about a minute each. Do you have a child-like passion? can i just have your nails for a day? Beautiful and unique nail art!!! thanks love :)) you and I are in the same boat!! wow i can't believe you can do that on yourself! 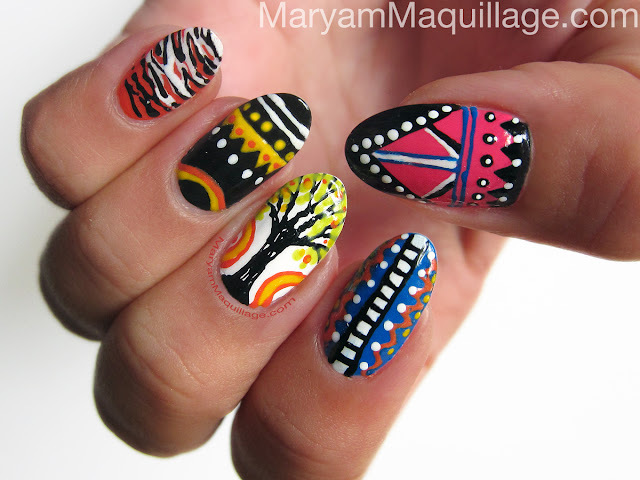 very aztec ish and artsy nice!! omg, you are so patient. The outcome looks amazing. I thought they were those nail stickers at first. Wow..I'm stunned..You have just raised the nail art bar several notches..brilliant! whoa! that's amazing! I wish I could do that with my right hand too. LOL! That looks absolutely amazing! Whenever I try to do nail art it just doesn't work out... Even a basic french is a struggle! Eye C U is my fave of the designs. Reminds me of the evil eye! thanks babe :)) you just gotta keep practicing and confidence is key. you have to believe that whatever you create will come out just the way you like it!! 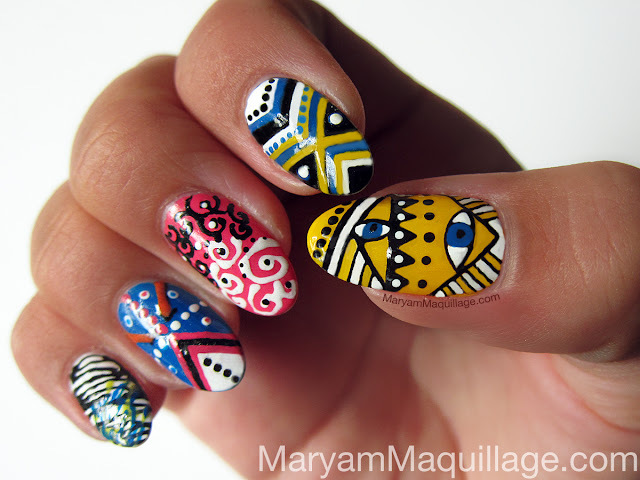 My goodness these are so chic, so artistic, and so very very Maryam! I'm in LOOOOVVE! The eye nail and the tree are my absolute favorite. 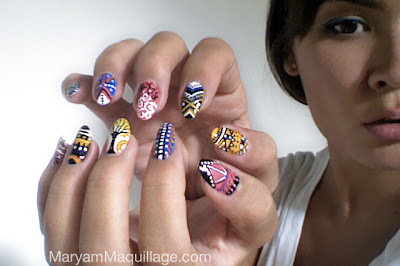 So inspired to fet insome nail art goodness! thank you my darling :))) I bet you'd create insane designs -- I've seen what you can do!!! This must be the most creative nailart ive seen! Amazing work Maryam! This is amaaaazing!!! You're so talented and so very creative! I wish I could be as creative as you are for just one day! I love all te designs!! The eye c u is so unique and reminds me of the Moroccan and Turkish "Evil eye" I'm in love with your nails, sigh.. <3!! wow! That is so beautifully made on both hands! So detailed! Great job! U r absolutely amazing&u have so much talent...! se ti a passa da me, ultimo post sulla clinique! wow Maryam! Perfect on both hands!! lovely nail art ! I hear ya!! BTW, I did this design at 2 AM while everyone was asleep!!! lol Thanks love :)) P. S. I love Beer too, I'm super excited for OKTOBERFEST!!! OMG !!! Amazing Nails !!! OMG!!! Your so very talented!! I wish that I could do this! Maryam!!! What can I say - LOVE LOVE LOVE!!!! 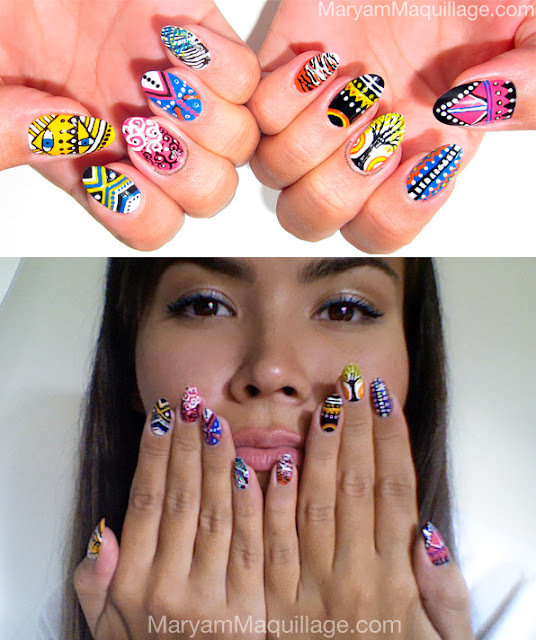 I can't believe the progress you've made with nail art and how bold of a design (designs!) you've tried here - these look awesome woman!! it's unbelieveable how much patience and love you put in your nail designs! wow wow wow wow!! I am impressed! As always, these are beautiful!!! wooow!!!!! u are so talented!!!!! ONLY AN HOUR!??? Damn if that isn't blowing my mind right now. girl, if you can draw, you can do this!!! You must have such steady hands!!! WOW! wow what a wonderful Nail art are designed. 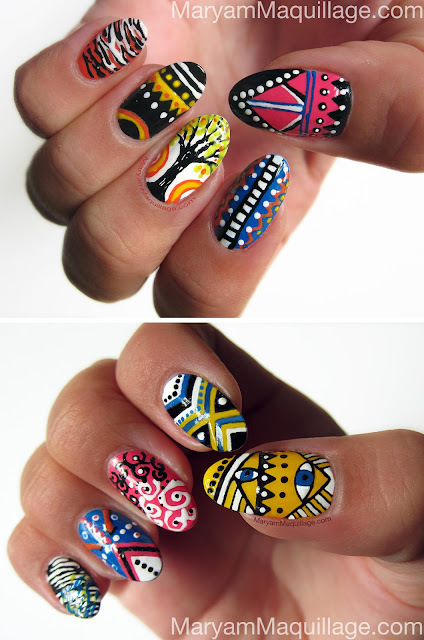 i love to see girls nail when it designed with nail-polish. it's looking very attractive and beautiful.